Rachel MacHenry seeks to sustain forms of craft production – often with unbroken histories stretching back for hundreds or thousands of years – which may be lost in the course of a single generation through globalization and shifts in local circumstances. Her work highlights the strength and beauty of traditional skills while placing them within the context of contemporary design. In her practice there is a continuous interchange between the processes of research, design and production, with new design collections reflecting regional cultures and local skills and materials. She works with artisans to preserve cultural knowledge, but also to create new expressions through collaboration and to bring these to a global marketplace. As a designer, she works at the intersection of craft, commerce, research and design, seeking out areas in which a high level of skill and refined tradition can be mobilized in a way that sustains local communities. Her design and production models are based on long-term partnerships with artisans, with the aim of providing stable incomes, good working conditions, and continuity of cultural information. She has worked extensively with artisans in Nepal and India, and has consulted on projects in Colombia, Haiti and Bangladesh. 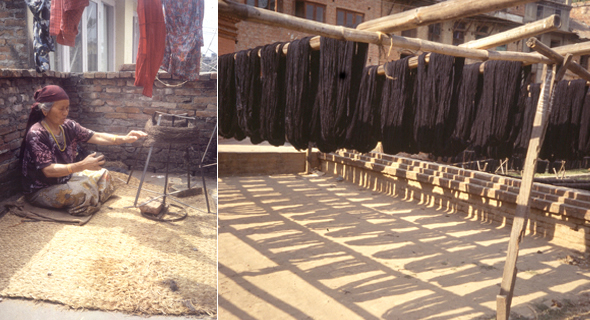 Most recently, she has been involved in developing the Botanica Tinctoria line of naturally dyed materials. You can learn more about Rachel’s projects at Handwork Studio.